The Universal Bass String Sets are suitable for replacing a single wound broken string when you don't need a whole set. 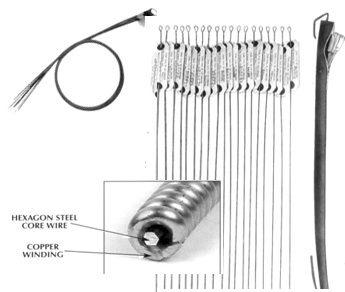 Unwind and snip off the covering wire, then cut the core wire to the proper length and install. Save the tag you use to send to us in case you need a replacement. An assortment of 37 strings adaptable to some of the better grands which use a lighter steel core and a heavier copper covering wire. Sized from .138" to .056" - $350.00 per Set. Very Heavy for replacement on Steinway & other grands.